Spider Solitaire FULL is a new exciting card game for all fans of amazing brain teasers and classic puzzles! This is a great game for you to relax or just spend some free time! Test your logic and become a king of solitaire! How to play: In this game you need to build a card column of descending suit sequence from King to Ace. You can move cards from the end of column to another column if it creates descending sequence. You can also move a packed descending sequence of cards as a group to another column if they are of the same suit. -	Enjoy classic card game wherever you go! -	Pick any background as a card’s back! -	Check and improve your logic! -	Great time killer app for having fun! -	Perfect app for brain training! 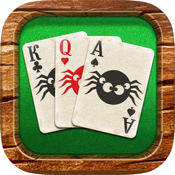 Try the awesome game Spider Solitaire FULL and improve your solitaire playing skills! Set your own card background and set new records with fun!